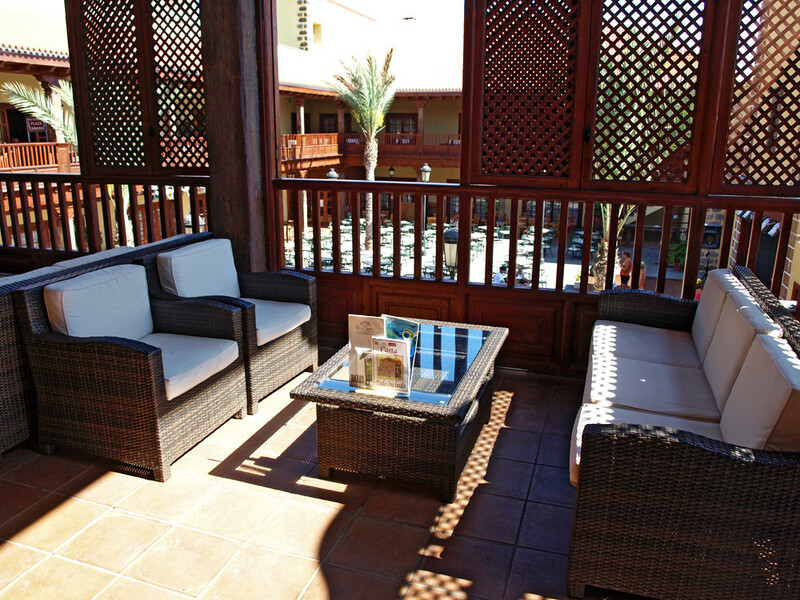 This is mid-August, peak holiday season, and the 4* Hotel Isabel in the heart of Costa Adeje is filled to capacity. 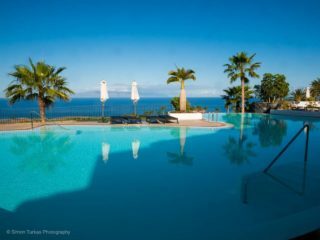 Advertising itself as a ‘family hotel’, Tenerife Magazine decides to brave the summer heat and the influx of families from the Spanish mainland and Canary Islands to check out what Costa Adeje’s Hotel Isabel has to offer. 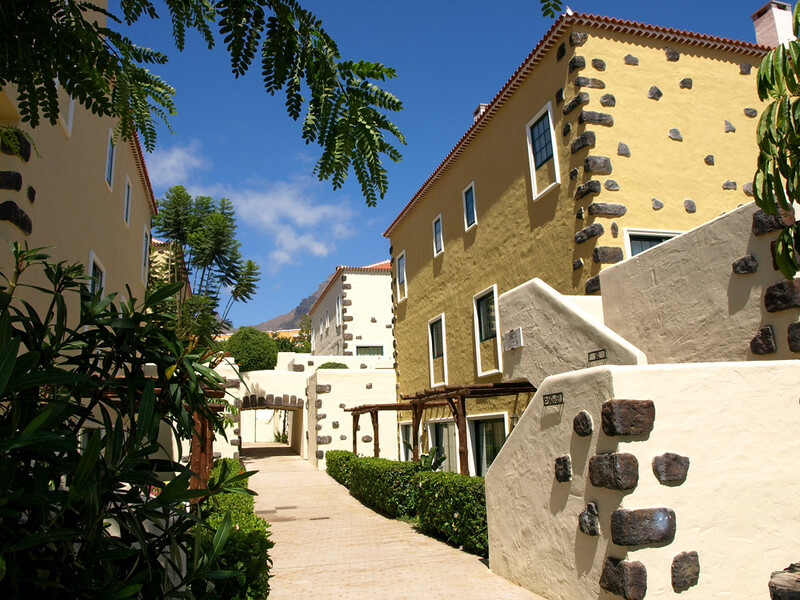 The eye-catching mustard tower and traditional Canarian, wooden balconied frontage of the Hotel Isabel belie the cornucopia of amenities and leisure space that lie beyond. It’s like stepping into a wardrobe and finding yourself in Narnia. Newly arrived for the weekend, I wander down leafy avenidas between neat rows of Canarian-style villas; around a tree lined Plaza de las Palmeras in whose centre a stone fountain plays and across wooden walkways above enclosed courtyards surrounded by red tiled roofs. I could be in the old quarter of La Laguna or La Orotava if it wasn’t for the perfectly manicured landscaping and the endless array of boredom-bashing activities that beckon. In the lobby a group of boys are half way through a World Cup qualifier match on the big screen video game while alongside, a teenager’s surfing the net in the Cybercafé and in the bar area his dad’s taking advantage of the free WiFi to check his emails. All around the expansive rooms and grounds, tots to teens are lining up cues on pool tables, clearing the net on table tennis, scoring goals on table football and climbing frames in playgrounds. Centre stage in the courtyard, I inadvertently wander through rehearsals for Harry Potter where the animation team are coaching wide eyed starlets in spell casting skills. Tiptoeing around Voldemort, I wander past the massage and beauty parlour; the tattooist and the gymnasium to discover the gaily painted windows of the Mini Club from which tiny voices are singing. Next door, a diving school waits to take me on underwater voyages of discovery. Just when I was wondering how many activities you could possibly fit into one hotel, I find myself in the sports area where tennis, basketball and football courts flank a volleyball sand court, an outdoor gym and a kiddies” adventure playground with a mini climbing wall. 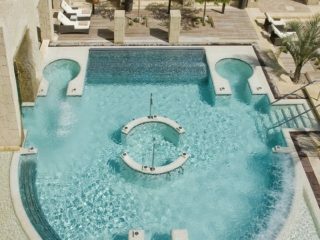 Feeling exhausted just from the thought of all that energy expenditure, I retrace my steps to the busy swimming pools and sunbathing terraces bedecked with glistening, prone bodies. Sitting in the irresistible shade of the laid back pool bar terrace with the Adeje Mountains shimmering in the heat haze above the bougainvillea lined gardens of the villas, I give my biceps a work out with a long, cool drink and wonder if I should have booked a week. 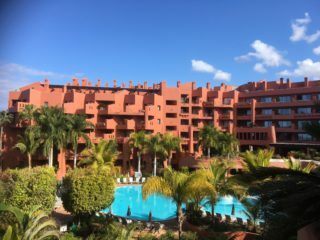 Location: Alongside commercial centres and restaurants in the heart of Costa Adeje, a 10 minute stroll from Fañabe Beach and 20 minutes from Puerto Colon. 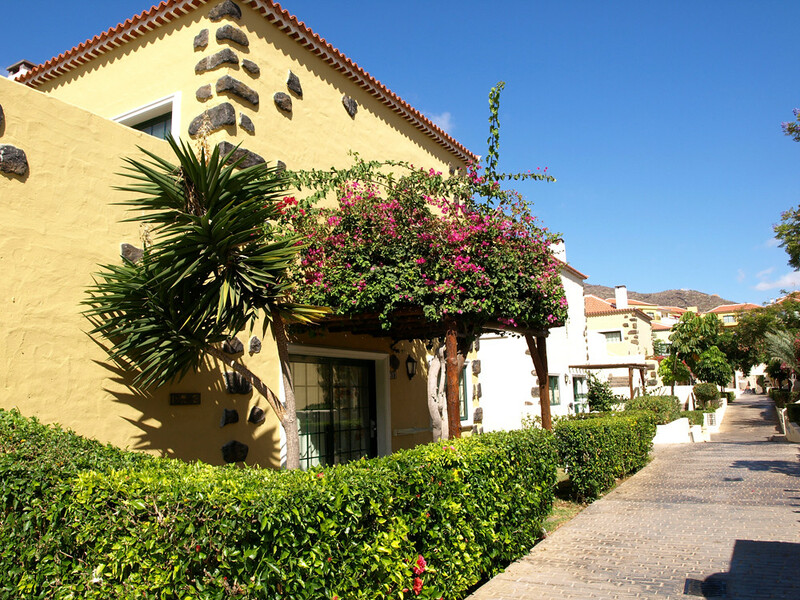 Rooms: Accommodation is in apartments in low-rise blocks or Canarian style bungalows and villas laid out like a village along landscaped streets. Plenty of space to spread out with good kitchen facilities, living room, bedroom, en suite bathroom and large terrace or private garden. Apartments are clean, bright and nicely decorated but lacking any wow factor. Service: Everyone we dealt with was friendly and professional from the cleaning staff to the animation team. Check-in was quick and efficient with multi-lingual staff and no queues. Dining room staff were fast and efficient so, despite the hotel being at capacity, tables were cleared and re-set with minimum of fuss. Food: Meals were buffet style in the large dining rooms and if you preferred, breakfast could be taken on the outside terrace. Pasta and pizza corner, a grilled meats section and a fresh fruit table joined an already overwhelming selection of meat, fish and salad dishes to keep everyone from the fussiest toddler to the family veggie happy. Despite the hotel being full, food was hot, fresh and constantly topped up and there was no waiting for tables. 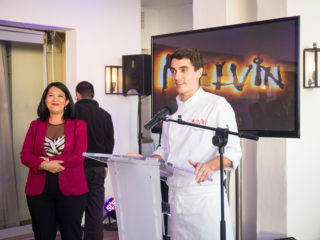 Entertainment: With the hotel’s family high season in full swing, entertainment was naturally geared towards the younger ones and the animation team had their work cut out keeping kids of all ages and mixed nationalities entertained from breakfast to bedtime. Rising valiantly to the challenge, music, singing and dancing kept Plaza Canaria buzzing until the midnight hour. 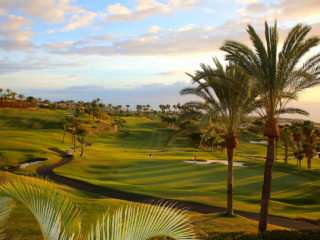 For those of us who were occupying a child-free zone, Costa Adeje’s nightlife was just a stroll away. 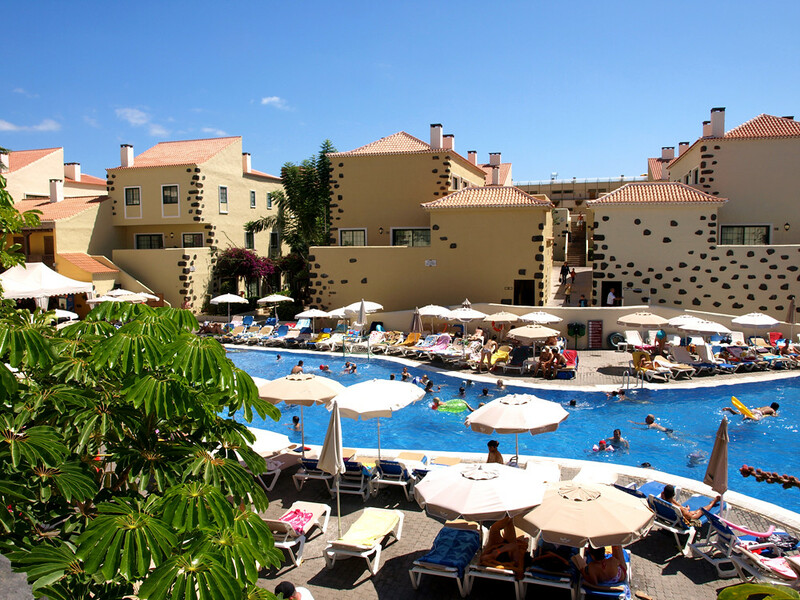 Overall: An excellent family hotel in a central Costa Adeje location offering good value for money and non-stop fun and entertainment to keep kids happy while Mum and Dad relax.